I have always loved hatchbacks and when I think of Toyota hatchbacks only two cars come to my mind, the legendary 1986 Trueno Sprinter more popularly known in Japan as the AE86 'Hachi-Roku', a rear wheel drive car still regarded as one of the best drift cars. The second being the Corolla WRC from 1999, the car went on to give Toyota a WRC constructors title. However in our small car loving country, I was surprised that Toyota has not introduced a hatchback in it's more than a decade of operations. 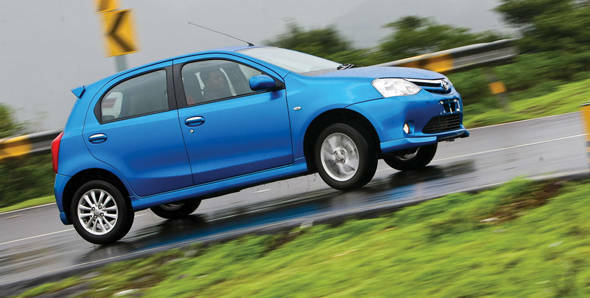 Yes, finally a hatchback from Toyota that has been specially developed for India, it's the Etios Liva. All cars sold in India with a Toyota badge have been simple and practical designs. None of them really stand out in the crowd; the Liva though begs to differ. Targeted at the younger audience, the Liva is definitely attractive especially in the 'Ultramarine Blue' shade we are driving. The other colour options are the same as the Etios. The car is in fact is almost exactly the same as the Etios hatchback concept displayed two years ago at the Auto Expo. Even though the car looks identical to the Etios sedan from up front to the B-Pillar, the rest of the car carries a completely different design approach. The shoulder line runs all the way to the sporty rear tail lamps giving it an edgy look when viewed from front three quarter. The curved tailgate and the chrome strip running across it remind you of the Etios sedan. The nose and grille are similar too but the top end VX variant gets a standard body kit that includes a front skirt giving it a tuner car feel. Side skirts, rear skirts and a rear spoiler complete the body kit package. The 15-inch alloy wheels with 185 section rubber available in the VX variant along with the body kit does a great job in complimenting the sporty design. The short rear overhang looks proportionate when compared to the front and it seems like the car was designed to look better as a hatchback than as a sedan. Overall the car looks very Japanese in nature and the choice of colours can make a lot of difference to the looks. Like the blue shade, Toyota should offer more such shades to go with the sporty and fun theme. Toyota is not wrong when they say that the Liva was designed to look like a happy face. Step inside the car and the interiors look familiar - they are a straight lift from the Etios. The centre instrument console, vertically mounted air con vents and the cooled glove box are all the same. The VX variant even gets the same red and black interior scheme and the flat bottom steering wheel seen previously in the Etios. These sporty details, thankfully, suit the Liva more than the Etios. However the Liva impresses in terms of interior space. Despite the wheelbase being shortened by 90mm, the rear knee room is similar to the longer wheelbase Etios, maximum front legroom is slightly lower while minimum legroom is identical. Rear headroom is better as the roofline doesn't slope down as much while the rear shoulder room is on par with the Etios. Boot space doesn't take a hit either and is generous as well. The Liva is a nice cabin to be in and feels airy and comfortable. The almost flat floor and even flatter rear seat comfortably allows three abreast at the rear making the Liva one of the most spacious hatchbacks available in the country and is definitely one of its strong points. The Liva features a new 1197cc, DOHC petrol engine designated 3NR-FE which has been designed specifically keeping India in mind. This helps the engine benefit from the excise benefits as it is less than 1.2 litres. The engine produces a healthy 80PS at 5600rpm and 104Nm of maximum torque at 3100rpm. The all new engine shares its architecture with the Etios' 1.5 litre unit. The engine also retains all four cylinders with four valves per cylinder. The downsizing results in the Liva's engine loosing the zing and zest of the Etios sedan's 1.5 nor does it feel as powerful as the Swift and i20. There is an evident lack of bottom end grunt and one needs to drop in to the lower gears to extract all the power. The funny thing though is that all this is deceptive because the Liva has one big advantage and that is weight. It is the lightest car in its segment with the base variant weighing less than 900 kilos. The VX variant weighs in at 920kg. This weight advantage translates to a class leading power to weight ratio of 87PS/ton and though we didn't really feel the Liva being very quick the Vbox threw up a 13.96second time for the 0-100kmph sprint. The quarter mile is covered in 19.62 seconds and while this doesn't make it the quickest hatch in its segment it isn't much slower either and that is commendable. However the car runs out of steam in the higher gears (the ratios optimised for fuel efficiency rather than performance) and it struggles to cross 140kmph and we managed to achieve a top speed of 151kmph after being very patient. gear comes in at 23 seconds and 37.66 seconds respectively. Braking is sharp and the car comes to a halt from 100kmph to standstill in a good 3.44 seconds covering 45.04 metres in process. What really sets the Liva apart is the ease of driving. The light weight translates to a fleetfooted feel to the entire driving experience, the steering is extremely light requiring no effort, the clutch is light and requires very little effort to engage, gear shifts are extremely slick and precise and the driving position is beautifully resolved. There's excellent visibility and the NVH levels are well supressed though when worked hard the engine note gets very disruptive. In fact we feel cabin insulation could have been better as there is quite a bit of road noise especially when the car is driven on bad surfaces. The Liva shines when it comes to fuel economy, after all the car focuses on efficiency. In fact according to the claimed ARAI-tested fuel efficiency the Liva returns a class leading figure of 18kmpl (the Micra is 18.06kmpl while the i20 is next best at 17.3kmpl). In our tests, the car returned 19.65kmpl in the highway and an impressive 14.8kmpl in the city translating to an overall figure of 16.01kmpl, and beating the i20 by more than 1kmpl. Rising petrol prices means more people opting for the car. The Liva then may not be performance oriented but is definitely the most economical to run in its segment. With its shortened wheelbase, the Liva offers a better dynamic charecter than the Etios though it is no hot hatch in the Swift mould. The suspension setup is similar to the sedan with fine tuning due to the lesser weight and shorter length. The car features MacPherson suspension at the front with a torsion beam at the rear. The suspension is tuned for comfort rather than serious handling and performs well for Indian conditions and soaks those potholes rather well. The Liva grips decently and feels more chuckable than the Etios though understeer sets in quite early to spoil the party and there is pronounced body roll. The steering isn't very communicative and is a bit too light for spirited driving. The tyres offer good grip and braking but the lower variants will differ in feel, response and ability, as the VX variant we tested came shod with wider 185 section 15-inch wheels while the lower variants are available with 175 section 14-inch wheels. The Liva is available in four variants just like the Etios.The basic J variant priced at Rs 4.12 lakh, ex-showroom, Mumbai gets no frills and safety equipment with only an air conditioner and wheel caps as standard equipment. The G variant is priced at Rs 4.52 lakh, ex-showroom, Mumbai and gets power windows and power steering while dual airbags, ABS and EBD are optional and will set one back an additional Rs 47,000. The V variant is priced at Rs 5.48 lakh, ex-showroom, Mumbai and offers a 2 DIN audio system with remote, alloy wheels, rear wiper and washer, tachometer and dual-tone fabric. The top end VX variant as seen in this test offers additional features such as dual tone red and black upholstery, a flat bottomed steering wheel with audio controls, body kit and rear spoiler. In fact, the Liva is extremely well matched in terms of feature loading with respect to its competition and this variant is priced at Rs 5.97 lakh, ex-showroom, Mumbai. With prices ranging from Rs 4.12 lakh to Rs 5.97 lakh, ex-showroom Mumbai the Liva slots itself well amongst the competition and offers similar equipment. There is no doubt that the Liva will eat into the competition's pie, particularly with its segment highest fuel efficiency figure, class leading overall space, Toyota's reliability and quality. It carries the Etios name tag further ahead and has even got the looks right. To ensure that the Liva and Etios do not have a long waiting period, Toyota has even announced plans to increase the combined annual production capacity of its two plants from 150,000 to 210,000 units in the first half of 2012. So for those of you who have waited for Toyota's first small car in the country it has definitely been worth the wait.